The message details Roy Keane’s fall-outs with Jon Walters and Harry Arter. 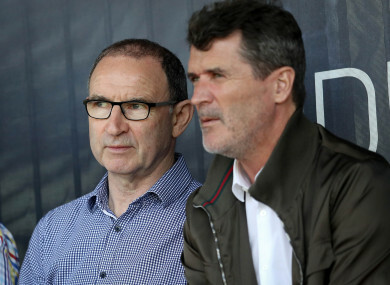 Ireland Senior Manager Martin O'Neill and Assistant Manager Roy Keane pictured in May. OVER FOUR IN 10 people support Roy Keane and Martin O’Neill in their roles managing the Irish football team. According to a new opinion poll carried out by Ámarach Research for Claire Byrne Live, 43% of over 1,000 voters support the duo, while 28% don’t and 29% are unsure. The poll was carried out yesterday, following the leaking of an audio message detailing Keane’s fall-outs with Jon Walters and Harry Arter prior to the summer friendly against France. O’Neill has sought to play down the message but refused to say if the altercation in question influenced Arter’s decision to make himself unavailable for selection. At yesterday evening’s pre-match press conference ahead of the friendly game with Poland, the Ireland boss confirmed the voice in question was Burnley full-back Stephen Ward, who was absent from that trip to Paris. “First of all, I don’t think Stephen [Ward] was there,” O’Neill said. There’s probably not anything more to really report. I think that differences of what was said, I think I said that to you before [there was a] confrontation obviously with Jon [Walters] and a confrontation with Harry [Arter]. “Jon’s fine, absolutely fine. Harry, perhaps not so fine. But I said to you before, you’d have to ask whether that’s the complete reason why Harry is not participating in these games this time. “But I think that you probably know that anyway, because I think that Harry has made that be known, some of the reasons that he has decided not to come,” O’Neill told reporters. Email “Four in 10 people support Keane and O’Neill in wake of leaked voice message”. Feedback on “Four in 10 people support Keane and O’Neill in wake of leaked voice message”.